Positive reviews continue to arrive for my recently updated & expanded nonprofit governance book. Click on this link for a story about the book. Policy vs. Paper Clips See the latest reviews below. This book was an informative and entertaining read. The author uses the techniques of a series of emails between two individuals to explain how using the corporate model for nonprofit boards is beneficial to the organization. The exchange of emails takes the reader through the process from needs assessment to implementation. What I enjoyed most about the book is that it was written so that the concepts are easily understood through the question and answers presented in each set of emails. In addition, the concept has been successfully implemented in a number of nonprofits around the country that are mentioned in the introductory section of the book and examples in the emails exchanges. At the end of the book an additional series of questions and answers with suggestions on how to successfully implement the corporate model. An added benefit is that a Leader’s Guide is available for use to facilitate a discussion of the corporate model process. I must admit that nonprofits that are totally volunteer operated or with a limited staff may find the overall process unachievable, but there are many useful ideas within the email exchanges from which small organizations can benefit. I strongly recommend this book to any nonprofit CEOs or Board Members who feel that too much time is spent on operational issues and not enough spent on planning and policy. When I joined the not-for-profit board that I now have the honor of chairing, I struggled with how to apply my business experience to a non-profit. I was often heard saying, in frustration, “We should be discussing policy and strategy, not counting paper clips!” Then I came across this book with a title that I obviously could not resist, and found that Fram has formalized what I was struggling to figure out. And his approach works. As with any model, you need to pick and choose which parts of it your organization needs to adopt, and in what order. But he sure gets you to think about the important things the board needs to address. 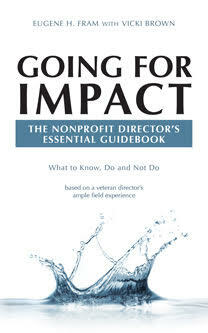 This is a must read for any non-profit board leader who wants to make the organization more effective in meeting community needs. Our Board applied the principles in Policy Vs. Paper Clips after the first edition came out many years ago. We were fortunate to have the author himself consult with us. I can unequivocally state that the Corporate model spelled out in this book works and is responsible for the incredible growth and success my not for profit has experienced over the last 15 years. More importantly the Board members love it because they are engaged at a strategic level that allows them to use their brains and contribute in a meaningful way. Every not for profit CEO and Board member should read this book regardless of size or scope of the organization. Its how Boards need to work in the 21st century. ← What To Do About Weak Nonprofit Board Practices – Reissued based on viewer interrest.